Dessert time! What I like about muffins is how handy they are. Yea, handy. You can take them with you as an after-lunch-snack or a snack while a walk or just as a snack any time anywhere. Many years ago someone brought for a barbecue party at my parts’ garden similar coke-flavored muffins and they disappeared in two shakes. 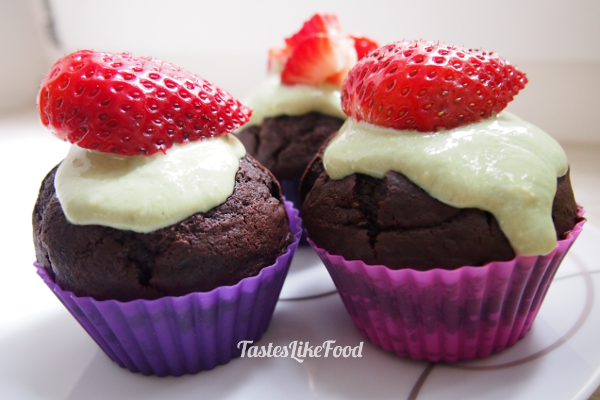 The muffins from the below recipe are more moist though and they taste more chocolaty. Don’t use here Life, Light, Zero or a Diet coke- you will lose the faint coke taste and will probably need to add some more sugar to compensate. 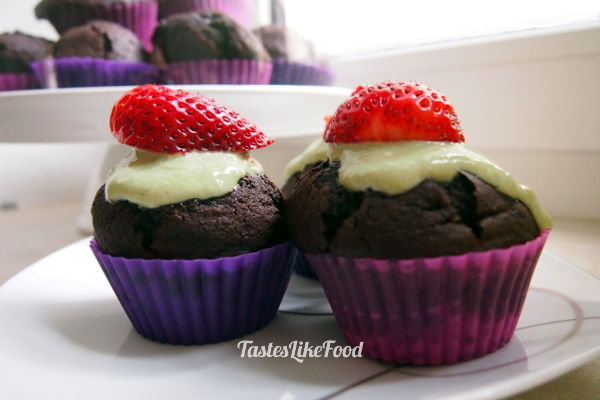 You can serve your Chocolate Muffins with some fresh fruits (any berries will do the job). I also did a super quick matcha topping (simply mix 100g mascarpone with 1 tsp of matcha powder, 2 Tbsp of icing sugar and 1 Tbsp of fresh lemon juice). Enjoy! Put cupcake liners into a 15-hole muffin tin (or into 2 smaller ones). In a small saucepan heat the butter until it melts. Add coca-cola and cocoa powder, mix well together. Pour sugar and stir until you get a smooth, uniform paste. In a small bowl sift the flour, the baking powder and the baking soda. Add a pinch of salt and leave to cool down. In the meantime whisk for 5min the eggs with a hand mixer. Combine all ingredients and mix them with a wooden spoon or with a hand mixer on the smallest speed, for a few seconds only, and stop immediately when the batter becomes uniform. Do not over-mix as this will result in a toughened crumb. Divide equally into the cupcake liners and bake for 20min or until a small skewer inserted into the muffin comes out clean. Allow the muffins to rest and cool down in the tins for 5-10 minutes.